The Berkeley Hotels uncompromising service and elegant surroundings capture the essence of the tradition of its namesakes Englands Berkeley Castle and Virginias Berkeley Plantation. The Berkeley Hotel stands at the crossroads of Richmonds business district and Historic Shockoe Slip. Within just months after opening the berkeley hotel achieved the aaa four-diamond rating and has held this honor every year since. Over the years the berkeley hotel and the dining room have achieved countless awards and honors. 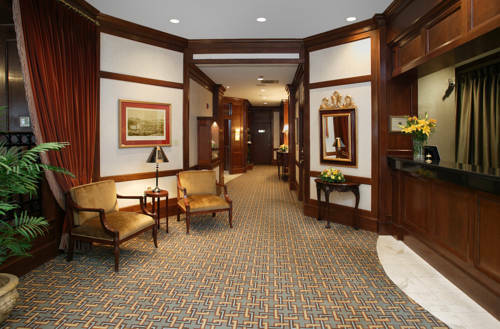 The Berkeley Hotels ambiance exudes serenity and warmth. Dark wood paneling in the boutique lobby and its adjacent dining room boasts a European flair where dramatic windows push to the ceiling offering diners a view of the Slips cobblestone and lamplights. Fifty-five elegantly appointed guest rooms display stylish decor and traditional furnishings from which scenes of revitalized Shockoe Slip may be enjoyed with its beautifully restored tobacco warehouses put to use as stylish new condominiums restaurants and boutiques. The Berkeley Hotel offers uncompromising AAA Four Diamond service including complimentary morning newspaper high-speed wireless internet service health club privileges at the YMCA cable television in-room coffee makers nightly turndown service in-room dining and same day laundry and dry-cleaning services. The Berkeley Hotel itself is reminiscent of that time more than one hundred years ago when Shockoe Slip was the center of commerce and politics. The hotels appointments the graciousness of its classic restaurant and the tasteful furnishings of its guest rooms take you back to an era when inn keeping was an art. Experience your home away from home where first-rate accommodations and service are customary every day at The Berkeley Hotel. Located in Historic Shockoe slip in the heart of Downtown Richmond on cobblestoned streets. We are within walking distance to many businesses as well as attractions.